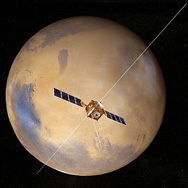 The Mars Global Surveyor (MGS) spacecraft was launched in 1996 to orbit the red planet and collect images of the surface using various instruments including the Mars Orbiter Camera (MOC), the Thermal Emission Spectrometer (TES), and the Mars Orbiter Laser Altimeter (MOLA). The spacecraft’s mission was to monitor and observe long-term trends in Mars’ atmosphere, collect data on geologically significant areas on the surface, and provide support for future Mars missions. Mars Global Surveyor accomplished all these objectives, remaining in contact with scientists for four times longer than initially expected. "After a 20-year absence at the planet, Mars Global Surveyor ushered in a new era of Mars exploration with its five science investigations. Mars Global Surveyor arrived at Mars on September 11, 1997 (September 12, UTC), and has contributed a multitude of findings, including signs of past, persistent water such as an ancient delta and currently active water features in the gullies of canyon walls." "Among key science findings so far, Global Surveyor has taken pictures of gullies and debris flow features that suggest there may be current sources of liquid water, similar to an aquifer, at or near the surface of the planet...Data from the spacecraft's laser altimeter have given scientists their first 3-D views of Mars' north polar ice cap." Read more at the MGS main homepage. Thermal Emission Spectrometer (TES):"The purpose of TES is to measure the thermal infrared energy (heat) emitted from Mars. This technique, called thermal emission spectroscopy, can tell us much about the geology and atmosphere of Mars." Read more at ASU's TES website. Mars Orbiter Camera (MOC): Learn about the camera system used aboard MGS at the Malin Space Science Systems website. Images from the MOC can be viewed here. Mars Orbiter Laser Altimeter (MOLA): This instrument has allowed scientists to study the topography of Mars and to construct detailed maps of the surface. For more information about MOLA, click here. "2001 Mars Odyssey is part of NASA's Mars Exploration Program, a long-term effort of robotic exploration of the red planet...For the first time, the mission globally mapped the amount and distribution of many chemical elements and minerals that make up the martian surface. Maps of hydrogen distribution led scientists to discover vast amounts of water ice in the polar regions buried just beneath the surface." 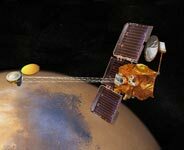 Read more about the mission at the Mars Odyssey homepage. Thermal Emission Imaging System (THEMIS): The purpose of THEMIS was "determining the distribution of minerals, particularly those that can only form in the presence of water." 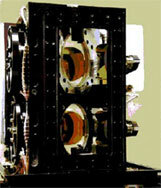 For more image about this instrument, visit the ASU THEMIS homepage. The Gamma Ray Spectrometer (GRS): "The Gamma Ray Spectrometer (GRS) instrument suite is a set of instruments aboard the 2001 Mars odyssey spacecraft 2001 Mars Odyssey.Two of these instruments (the Neutron Spectrometer and the High Energy Neutron Detector) detect neutrons released from the surface of the planet. The third instrument (the Gamma Ray Spectrometer) detects gamma ray photons coming from the planet. Together, these instruments help us learn about the composition of the Martian surface. The information collected by GRS will be used to help determine the composition and location of the elements on Mars. This includes production of a global map of water deposits and other elements on Mars; an estimation of the depth of water deposits; and continued study of how seasons affect the polar ice caps." Read more at the University of Arizona 2001 Mars Odyssey Lunar and Planetary Lab. "Mars Express is Europe's first mission to the Red Planet. It carries seven instruments and deployed a lander, Beagle 2. The lander was lost during its attempt to reach the planet's surface but the orbiter continues its highly successful on-going investigation of Mars and its two moons, Phobos and Deimos. Mars has always been a source of intrigue and fascination. It is currently the only planet in the Solar System on which there is a strong possibility of finding the evidence of past life, perhaps even existing organisms. It is also a prime candidate for future manned exploration." Read more at the Mars Express website. The High Resolution Stereo Camera (HRSC):"The HRSC is imaging the entire planet in full colour, 3D and with a resolution of about 10 metres. Selected areas will be imaged at 2-metre resolution. One of the camera's greatest strengths will be the unprecedented pointing accuracy achieved by combining images at the two different resolutions. Another will be the 3D imaging which will reveal the topography of Mars in full colour." Read more at the Mars Express Instrumentation website. OMEGA: IR Mineralogical Mapping Spectrometer:"Using the fact that different materials absorb and radiate light at different wavelengths, OMEGA will build up a map of surface composition by analysing sunlight that has been absorbed and re-emitted by the surface. The instrument will also glean information on the composition from the wavelengths of infrared radiation given off as the surface cools. As radiation travelling from the surface to the instrument must pass through the atmosphere, OMEGA will also detect wavelengths absorbed by some atmospheric constituents, in particular dust and aerosols." Read more at the Mars Express Instrumentation website. The Planetary Fourier Spectrometer (PFS):"The principle behind PFS is similar to that behind OMEGA: both instruments will identify complex molecules from the wavelengths the molecules absorb from sunlight and from the infrared radiation (heat) they emit. PFS, however, will take measurements over a wider wavelength range (1.2-45 µm) than OMEGA, which makes it best suited for identifying molecules in the atmosphere." Read more at the Mars Express Instrumentation website. Mars Advanced Radar for Subsurface and Ionosphere Sounding (MARSIS): "MARSIS is a low frequency, nadir-looking pulse limited radar sounder and altimeter with ground penetration capabilities, which uses synthetic aperture techniques and a secondary receiving antenna to isolate subsurface reflections." Read more at the Mars Express Instrumentation website. The mission of the Mars Reconnaissance Orbiter was to search for evidence of long-standing bodies or flows water on Mars' surface, examine small-scale features in greater detail, and test telecommunications systems for use in future spacecrafts. Read more about the mission, instruments, and important discoveries at the JPL Mars Reconnaissance Orbiter website. HiRise:"By combining very high resolution and signal-to-noise ratio with a large swath width, it is possible to image on a variety of scales down to 1 meter, a scale currently afforded only in glimpses by landers. HiRISE will offer such views over any selected region of Mars, providing a bridge between orbital remote sensing and landed missions. Stereo image pairs will be acquired over the highest-priority locations with a vertical precision of better than 25 cm per pixel." Read more at the NASA HiRise website. Mars Color Imager (MARCI): MARCI has a number of important functions, including providing weather maps to allow for study of climate variations, observing aeolian processes and polar cap changes, and observing atmospheric variations. Read more about MARCI at the MSSS website. 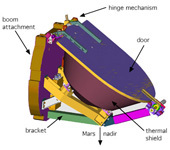 Compact Reconnaissance Imaging Spectrometer for Mars (CRISM): "CRISM is an instrument on the Mars Reconnaissance Orbiter, launched in 2005 with the primary objective to search for mineralogic evidence for past water on Mars. CRISM’s observations, in part, confirmed the presence of large amounts of water on Mars in the past, and continue to reveal an extraordinarily complex geologic history of Mars." Read more at the CRISM website. MRO Context Imager (CTX): The MRO Context Imager captures images of larger areas of the surface to provide context for the higher spatial resolution pictures taken by CRISM and HiRISE. The CTX also studies atmospheric affects on the surface and monitors climate and geological processes. Read more here. Shallow Subsurface Radar (SHARAD): "SHARAD (Shallow Radar) looks for liquid or frozen water in the first few hundreds of feet (up to 1 kilometer) of Mars' crust." This instrument probes the surface with radar waves. Its antenna picks up the radar wave return, which has different strengths for different materials on the surface. Read more. Mars Climate Sounder (MCS): "The Mars Climate Sounder will observe the temperature, humidity, and dust content of the martian atmosphere, making measurements that are needed to understand Mars' current weather and climate, as well as potential variations that may occur. Scientists will use these measurements to understand how the martian atmosphere circulates and varies over time. The measurements will also help explain how and why the martian polar caps vary in response to the atmosphere and the energy input from the Sun." Read more. 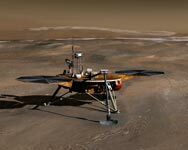 The Phoenix Lander is the first of NASA's Mars Scout class. The purpose of the Phoenix Mars Mission was to study the history of water on Mars as well as collect information on the habitability potential in the martian soil. The Phoenix Lander was launched in 2007 and transmitted its last communication on November 2008. The mission was successful in examining the soil composition and confirming a water ice layer beneath the surface. Read more. ASU TES Data Archive: This is the official PDS Data Node for MGS-TES data maintained by ASU. PDS TES Node: NASA maintains the Planetary Sciences System archives, with data available on the moons and planets of the inner Solar System, including Mars. PDS MOC Node: The Planetary Data System hosts and archives the MOC data. PDS MOLA Node: The Mars Orbiter Laser Altimeter last acquired data in 2001, and now the MOLA data is archived by PDS. MGS MOC Images: The MSSS website maintains captioned image releases from their instruments. PDS THEMIS Node:THEMIS data is maintained and archived by the Planetary Data System. ASU THEMIS Data Archive: THEMIS data is also available at the ASU THEMIS Mission site. THEMIS Gallery: Images from THEMIS aboard the Mars Odyssey are available at the ASU website. PDS GRS Node: GRS data may be found in the archives of the Planetary Data System. LPL GRS Data Node: LPL at the University of Arizona also hosts GRS data. ESA Planetary Science Archive: The European Space Agency, which launched the Mars Express, maintains a data archive. PDS OMEGA Node: The Planetary Data System also hosts OMEGA data. PDS MRO Node:The Planetary Data System hosts data from the instruments aboard the MRO. Ultimately, any images returned by a spacecraft must be processed locally before they can be used for real science. There are many different software packages available for doing various types of image processing and previewing. Listed here are just a few of them. To process RAW data files, use ISIS. If you have access to IDL, you may use the extra IDL software below to make use of THEMIS images. To browse Mars and a collection of some of the science data available, try out JMARS. ISIS is a heavyweight image processing suite. This package can be used to manipulate images from NASA space craft missions to Mars, Jupiter, Saturn, and many other solar system bodies. You must have a POSIX compatible operating system to use ISIS. See this tutorial for more information. The Read Themis IDL code written by Drs. Hugh H. Kieffer and Timothy N. Titus at the USGS Flagstaff Field Center in conjunction with the THEMIS SCIENCE TEAM have been updated! Questions about the use of READ_THEMIS or READ_RDR should be directed to Dr. Timothy N. Titus. These programs are provided as a community service with no warranty. Download version 7.6.11 of the updated IDL code that reads THEMIS image cubes. JMARS is a software package that runs on Java (version 1.4) and will allow anyone to download preview images of real science data. To start with, make sure that you have Java version 1.4 installed. More information on Java is available at the JMARS web site. Then, download and run the jmars.jar file. This should get you started with a MOLA background. Add layers to see other datasets. This tool is nearly the same as one used by scientists. The difference lies in what data sets are available for use. PIGWAD offers several different levels of interface to planetary GIS information. Start by clicking on “PIGWAD Maps” on the right hand side of the link above.